NEM, short for New Economy Movement is a smart contract platform with XEM as its native tokens. NEM was launched on 31 March 2015 and introduced the Proof-of-Importance (PoI) consensus algorithm to the cryptocurrency community. Proof-of-Importance is different from Bitcoin’s Proof-of-Work (PoW) mining algorithm as there is no mining in PoI. PoI is a slight variant of the Proof-of-Stake (PoS) algorithm. In PoS, block rewards are determined based on the number of tokens staked whereas in PoI, block rewards are determined based on the nodes’ importance score. The nodes’ importance score is calculated based on the amount of tokens held and the amount of activity generated by the nodes. NEM allows users to create custom tokens on top of the NEM blockchain and these tokens are known as NEM Mosaics. You may think of NEM belonging to the same category as Ethereum as a smart contract platform and NEM's Mosaics being similar to Ethereum’s ERC20 tokens. 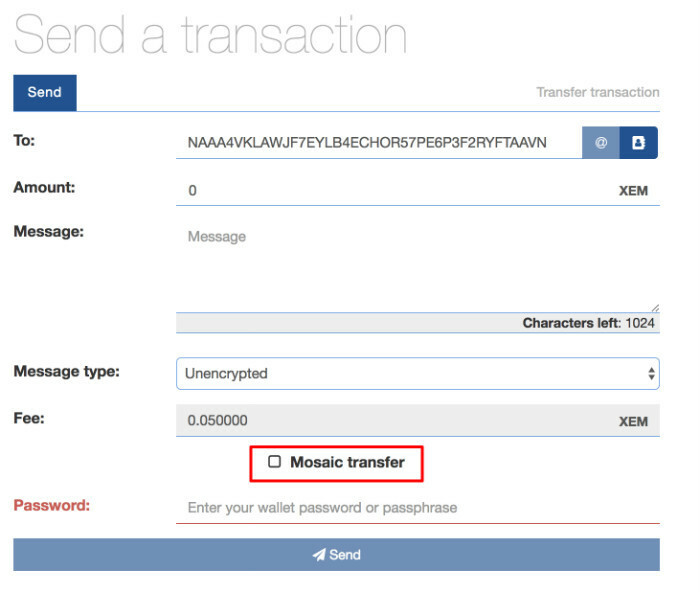 Following is a step-by-step guide on setting up a NEM wallet to hold XEM and its Mosaic tokens securely. One odd thing to note with regards to NEM is that there is no online wallets available to store your NEM and Mosaic tokens unlike Ethereum’s MyCrypto or MyEtherWallet online wallet. To access NEM on your desktop, you will first have to download the NEM Nano Wallet from its website. There are several wallet options available and if you are interested in using the Trezor hardware wallet to store your tokens securely, I recommend downloading the Universal Client (with Trezor Support). It may be a little confusing at a start but the way to go around navigating this is to look at the top right of the menu bar and click the Login button if you have a Trezor wallet or to click the Sign Up Button if you want to create a new wallet with a corresponding private key. I will walk you through the steps in creating a wallet. If you have a Trezor hardware wallet, skip this section and go to the next section directly. Clicking on Sign Up will bring you to this page where you are given an option to create a Simple wallet or a Private key wallet. Click on the Simple Wallet button to create a new wallet. The following few steps are relatively straightforward where you just need to follow the on-screen instructions and select Mainnet. Choose a wallet name and a corresponding password to protect your wallet file. The next step is pretty interesting where you have to move your mouse across the screen to generate enough randomness for the private key. Once done, you will be prompted to download the .wlt wallet file. You are asked to backup your private key somewhere too. It will be shown when you click the “Show private key” button. It is highly recommended that you write this on a piece of paper and store it safely instead of copying the private key somewhere on your computer. Never disclose this private key to anyone else. After this you are given your NEM public key which you may give to others to send XEM to you. To login to your wallet, click on the Login button on the top right. If you have a Trezor, click on the Login with Trezor button. If you created a wallet in the earlier steps, click on the “Select wallet” dropdown and enter your password followed by the “Sign In” button. If you are using Trezor, the next page will ask if you want to connect to the Mainnet or Testnet. There is also a dropdown option named Mijin. Mijin in this case refers to a private blockchain software built on NEM technology and is disabled for most users. In our case, we will want to login to Mainnet where addresses start with ‘N’. You will be prompted to accept the incoming connection on your browser and next on your Trezor. Accept them and you will be greeted with your NEM wallet! One of the thing that I really dislike about this wallet is that it is hard to find my NEM wallet address. Only after poking around a few buttons did I discover that the public key is sitting in the Account : Primary tab which I have to click on the top menu bar. There is so much space available on the sidebar which I thought could be utilised to display the wallet address. 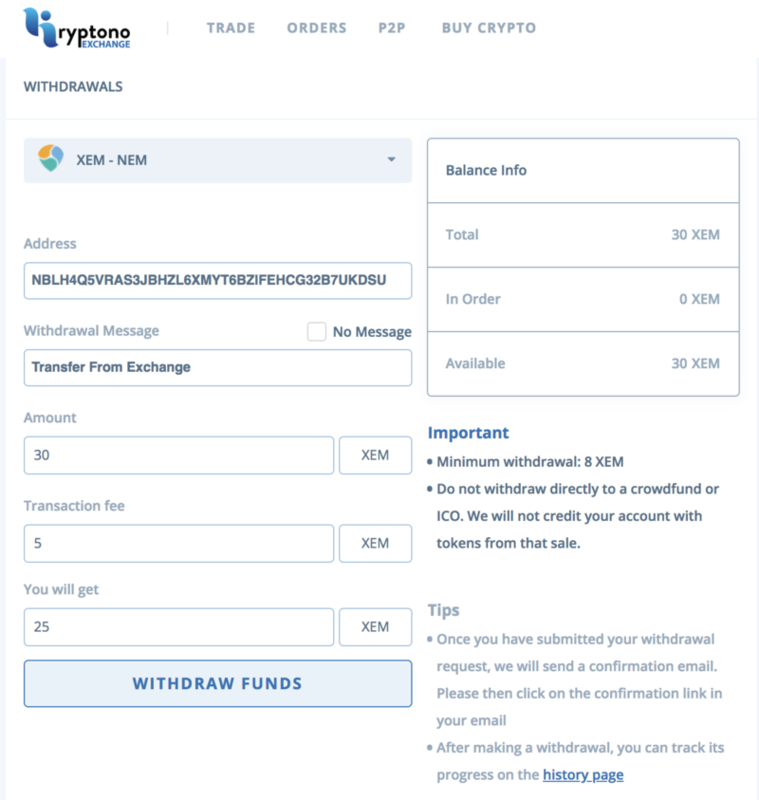 I will proceed to fund some NEM in my wallet which in this case I will withdraw from Kryptono exchange. Note the Withdrawal message I placed above which showed up on my NEM Wallet Dashboard below. Sending NEM is pretty simple. 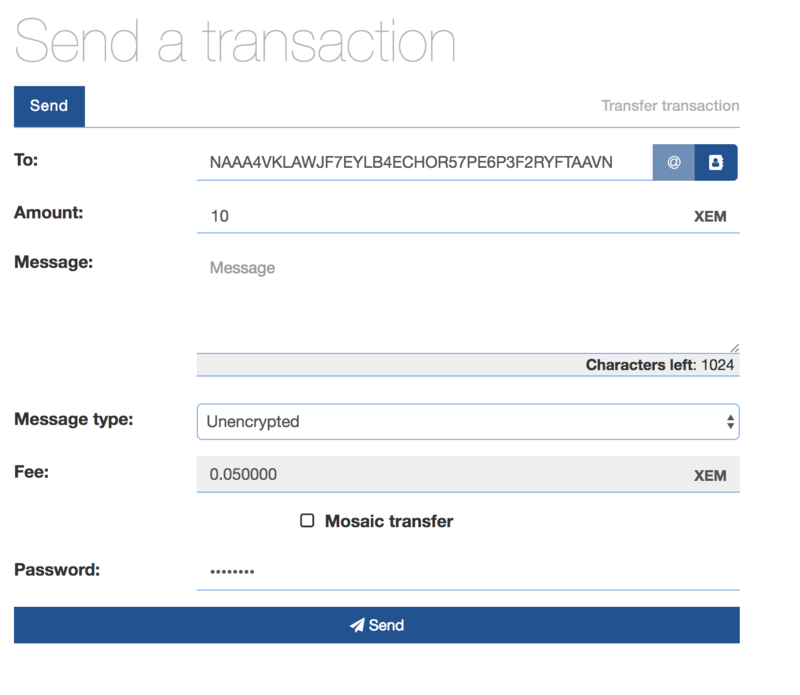 Click on the Send button at the top and fill up the NEM address and amount to send. You can include an optional message and then hit the Send button! It will sit in the Unconfirmed tab for a few minutes and once your transaction is confirmed, it will be on the Confirmed tab. Sending NEM Mosaics is a confusing process for first timers and I will detail the steps here. The Mosaic Transfer process is very clumsy. To begin, I have to check the Mosaic transfer button at the bottom of the screen. After clicking on that checkbox, an option shows up on the right. 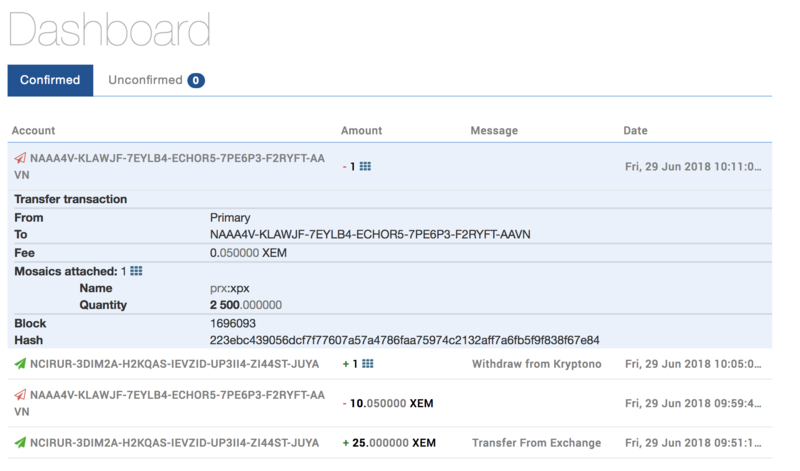 The currency dropdown defaults to “nem:xem”. I have to select a Mosaic to send out. In this case, I have deposited some ProximaX (XPX) to my wallet earlier and I will attempt to send them here. Clicking on the “Attach” button will bring the following screen below where I can finally set the amount of ProximaX that I would like to send. That’s all for the guide. I hope you find this guide useful in learning how to get started with the NEM Nano Wallet!